After your child has taken the ATV RiderCourse, it’s time to practice what they have learned. 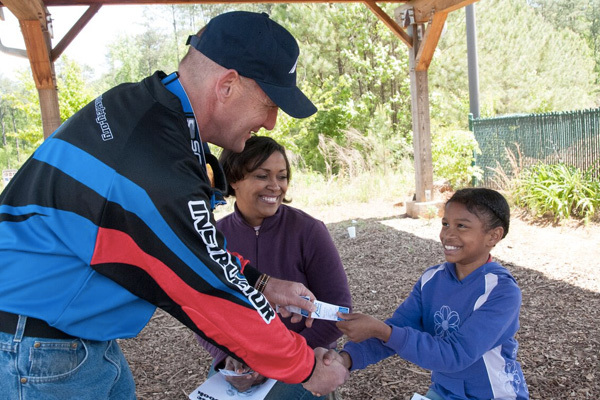 Their Instructor gave them the building blocks to become a safe and responsible rider, now it’s your turn to enforce the Golden Rules of ATV Safety. The ATV Safety Institute recommends riders, especially young riders, refresh and fine-tune their skills as they grow. Initially, young ATV riders will have their hands full learning to steer and use the controls. Don’t complicate things with a difficult riding area. Find a level dirt or grassy surface about 100′ x 200′, free of obstacles such as rocks, stumps and holes. Never ride an ATV on paved surfaces such as concrete or asphalt. Paved surfaces can seriously affect handling and control. Remember, ATVs are not street legal. Keep the area free of other riders who may distract a new rider. The first few “rides” should be with the engine off. Make sure the rider is wearing proper riding gear. Have them check that the parking brake is set, then mount the ATV from the side. All of these exercises are done with the engine off. Repeat the exercise while you slowly push the ATV. Make sure they follow the same turning technique they practiced earlier. Push the ATV forward slowly and have the young rider operate the brakes. Let them discover how much pressure is needed to stop smoothly. Practice until you are confident that they have the skill to slow down and stop in a controlled manner. During the whole maneuver, they should have their head up, be looking forward, and have both hands on the handlebars and both feet on the footrests. With the engine off, have your young rider go through the motions of smoothly moving the throttle to increase speed and smoothly releasing the throttle to decrease speed. Have them release the throttle and smoothly apply the brakes. Have them do this several times until it is automatic. Again, they should have their head up, be looking forward, have both hands on the handlebars and both feet on the footrests. With the engine off and the ATV stopped, have the young rider practice proper turning. They should look in the direction of the turn, turn the handlebars in the direction of the turn, and move their body to the inside of the turn. Have them do this several times in both directions until the movement is automatic.